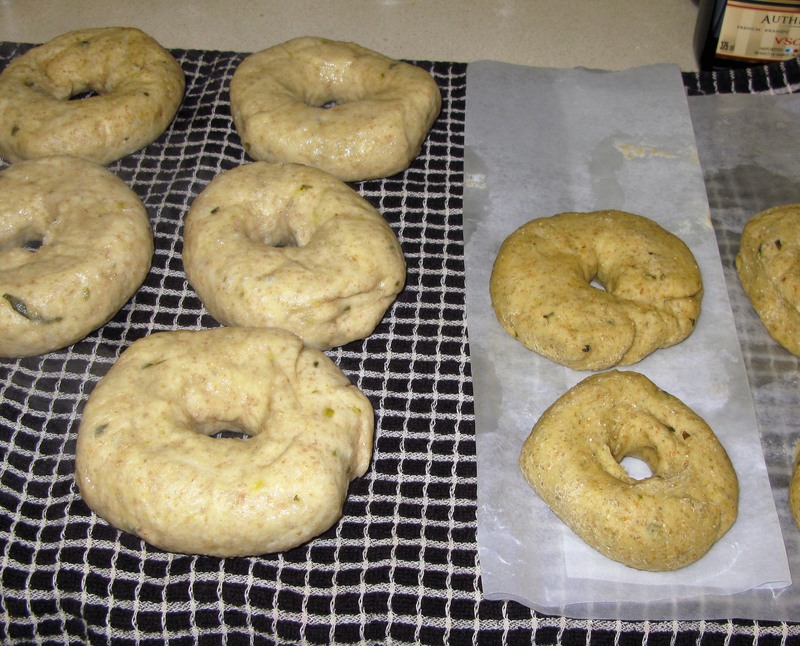 Pickle Bagels | I Wanna Bake! Yes, you read that right: pickle bagels. I promise, I haven’t gone off the deep end (no more than usual, anyway). Those of you who follow I Wanna Bake on Facebook might recall seeing Tasting Table’s recipe for pickle juice bread. I was quite enamored of the idea or pickle-flavored bread, and I knew it would have to be recreated in some fashion. Serendipitously, I still had the thought on my mind when I was going through one of my periodic musings on bagels ( like ya’ do). In that moment, the pickle bagel was born. This recipe is a mash-up of the aforementioned pickle juice bread recipe and the bagel recipe in Selections from Betty Crocker’s Cookbook. 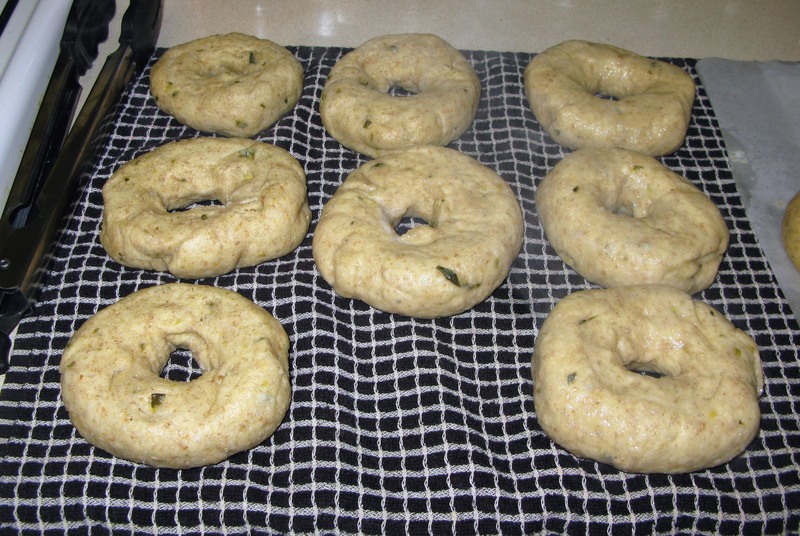 I’ve used this bagel recipe many times before with decent results, but the added moisture from the pickles did mean more flour was needed to maintain the proper dough consistency. I took the suggestion to add in some rye flour from the pickle bread recipe, and I was happy with the result. It is very similar to whole wheat in flavor, and that complemented the pickle flavor and texture nicely. I was honestly surprised by how subtle the pickle flavor was. The next time I make these, I think I would probably add a tablespoon of fennel or caraway seeds and some dried dill for added texture and flavor. These would probably also make good everything bagels. All you’d have to do would be to sprinkle the toppings of your choice (I usually use sesame seeds, poppy seeds, kosher salt, and dried onion) on top after brushing the bagels with egg wash. Serve them with some scallion cream cheese, and you’re good to go. The New Yorker in me was about to wax poetic about the ideal bagel, but I’ll spare you. Suffice it to say that these aren’t quite what you’d find in a New York deli or bakery, but they are still pretty good. They sated my bagel craving, and at the end of the day, that’s what they’re meant to do. If you have a favorite bagel flavor you’d like me to try my hand at making, ask away! For a food as ridiculous (but enjoyable) as pickle bagels, you need music as ridiculous (but enjoyable) as ZZ Top. Seriously, a band that can write a song called Tush while dressed like… ZZ Top… deserves to be the soundtrack to this bakeventure. Stir the 2 tablespoons of granulated sugar into the warm pickle juice until the sugar is completely dissolved. 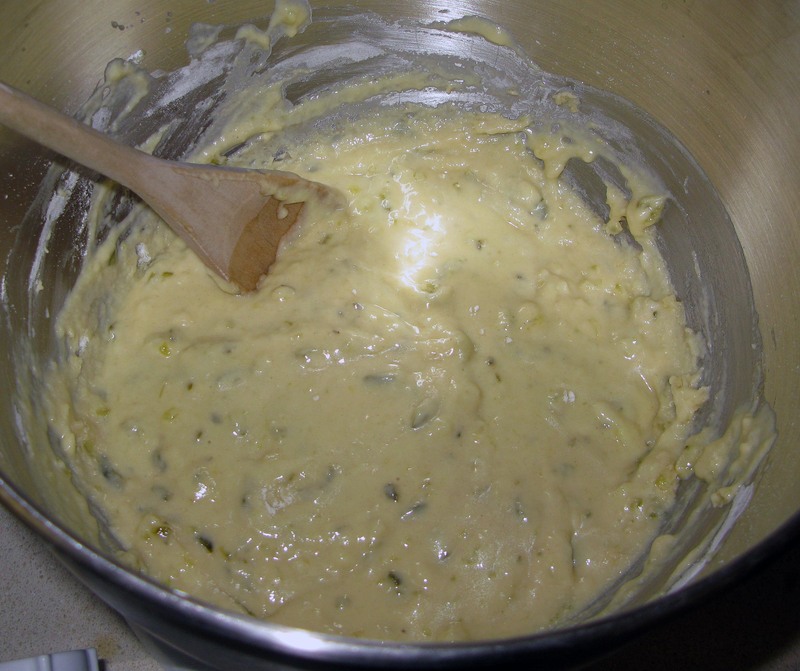 Sprinkle the yeast on top of the pickle juice and leave it alone for about 10 minutes, or until it looks creamy. 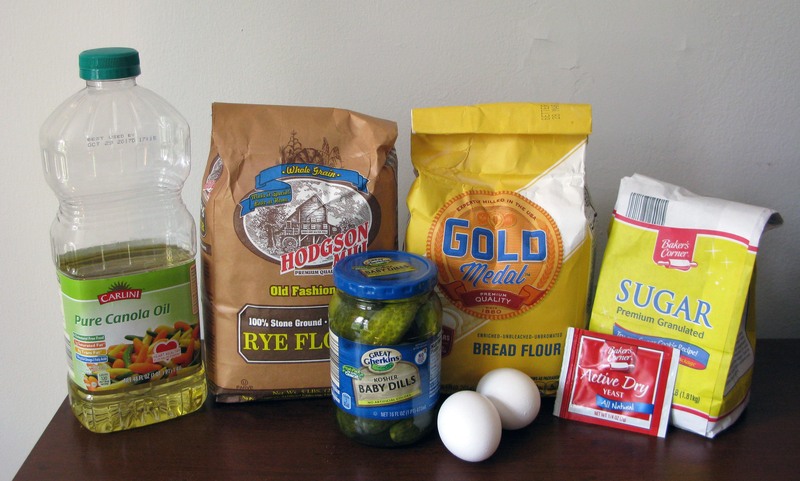 When the yeast is ready to do business, add in the minced pickles, eggs, and vegetable oil and stir until combined using a dough hook or wooden spoon. Add in 1¼ cups of the bread flour and stir until smooth. Add the remaining bread and rye flour and knead (using a stand mixer or by hand on a lightly floured surface) until the dough forms a smooth, slightly stick ball (this takes about 5-10 minutes). Place the dough in a greased bowl, turning once to coat the other side, and leave it to rise in a warm place, covered, until it doubles in size, about 45 minutes. When the dough is sufficiently bulky, punch it down. You can see the progression in the pictures below. 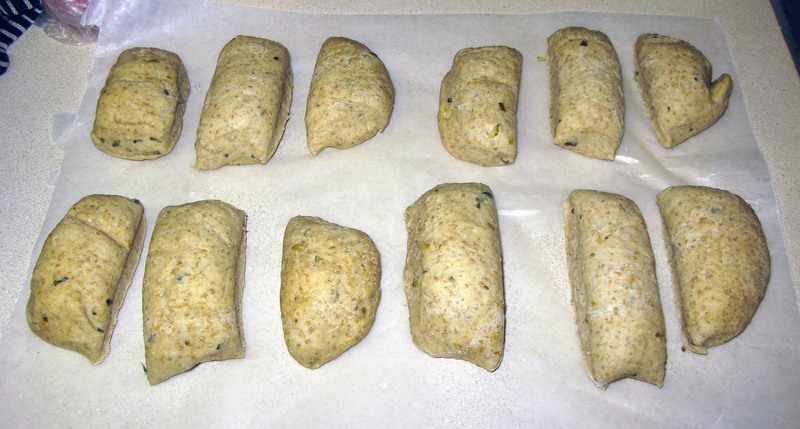 Divide the dough into twelve equal portions using a dough cutter or sharp knife. The next part is a little difficult to explain. Pick up one dough portion and hold it with the cut side facing up. Squeeze the dough into a thick, circular disc (the cut sides will make the flat sides of the disc). Using your fingers, poke a hole in the middle of the disc and shape the newly-formed ring until it is roughly uniform all the way around (it should look like a bagel). Arrange the bagels on cookie sheets, leaving some space between them, and let them rise, covered, for 20 minutes. They probably won’t look too different, but they should end up at least a little bit bigger and puffier. After the bagels have risen, preheat your oven to 375°F and line cookie sheets with foil. Stir the remaining granulated sugar into the 2 quarts of water in a large saucepan or Dutch oven. Bring to a boil, then reduce to a simmer. 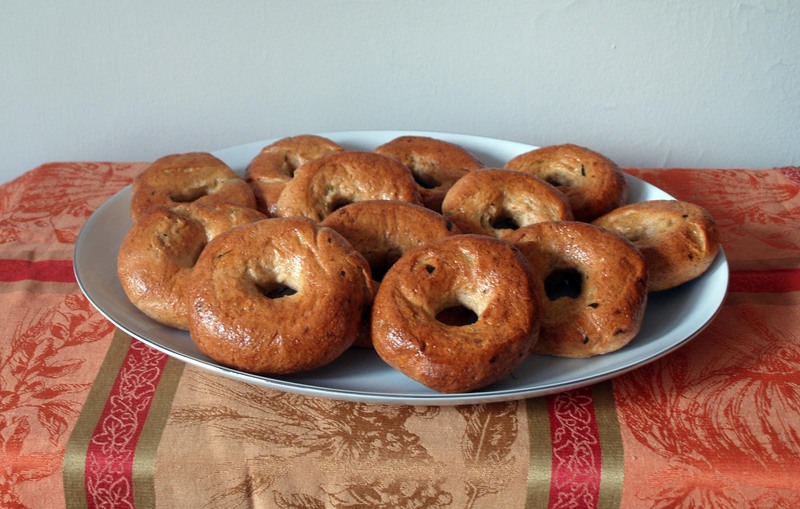 Drop 4 bagels into the pot and simmer them for 4 minutes, carefully turning them once after 2 minutes. Let the bagels drain on a towel while you repeat the process with the remaining bagels. In a small bowl, beat the remaining egg with the tablespoon of water until smooth. Brush the tops of the drained bagels with the egg wash and transfer them to the cookie sheets. If you brush the egg wash onto the bagels after arranging them on the cookie sheets, make sure to wipe the excess off the foil to prevent burning. 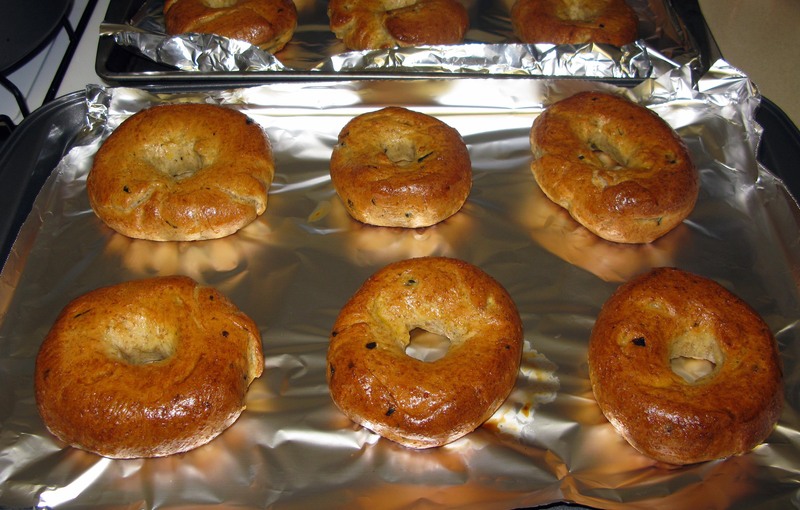 Bake the bagels for 30-35 minutes, or until the tops are brown and shiny. 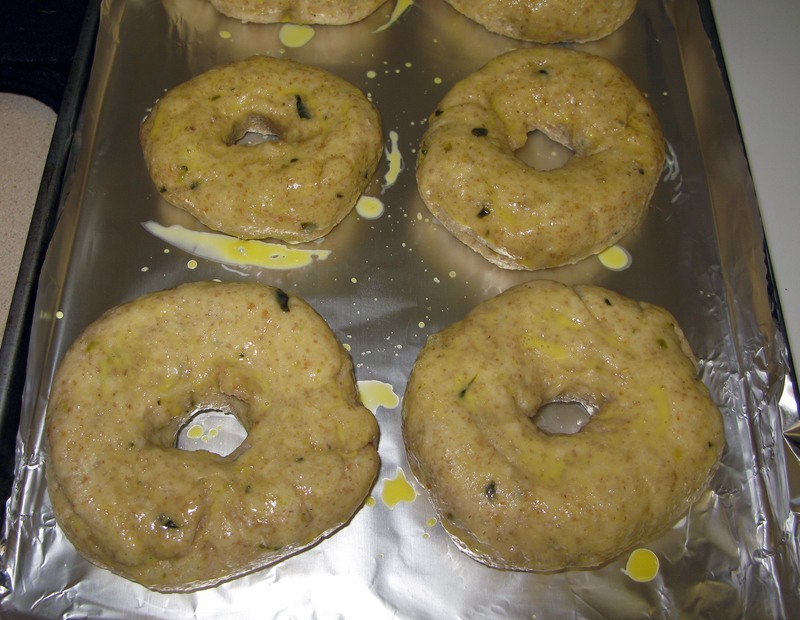 Remove the bagels to cooling racks to cool completely when they are cool enough to handle. Serve immediately with scallion cream cheese. Store the leftovers in an airtight container for up to 5 days, or freeze. Pingback: Bagel Dogs | I Wanna Bake!